What trialsin bikes did you ride? Montesita T10 then T15 then T12, because when I make the first Spanish Championship race in 82, I win with the T15. I was very small. When we get there all the top riders from Barcelona have very special bikes, very short handle bars, very short frames and then they make the T12 and Pedro Pi say this is much better for you so I start with the T12. Then I finished, I think I finished with the Monty the blue one, but I am not sure. Were you sponsored and did you have a contract with them? No no no no my father was paying and I go there and ride the trial. Everything was much cheaper those days, it’s much much much more now. Did your mother ever come along to the trialsin to watch? Did your parents come and watch you ride the moto as well? Yes many times. She was very ….I don’t know how to say this ha ha. Before the races she was like “hey, you have to clean your teeth, you have to clean your underwear because if you crash ….you know and they have to take out your clothes you much be clean”. I remember one time I was riding with a Cota 200 and I have a crash and I hit my knee and I was like this aaarrggghhh and she arrives and she said “You have dirt here, clean it clean it “ . She was very funny. She liked things perfect ha ha. Who was your trials hero as a young man? All of the Montesa riders. When I was a kid I just look for the Montesa riders . 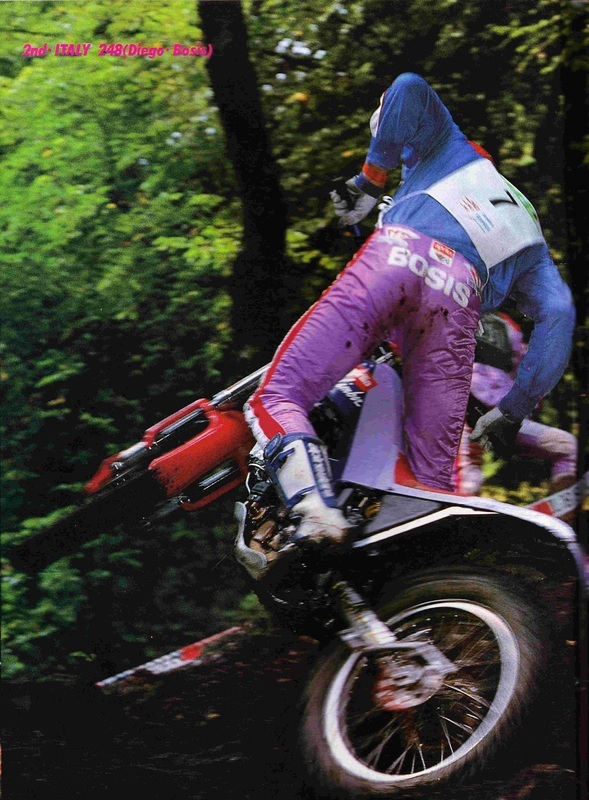 It doesn’t matter if you are Vesterinin or ….Malcolm Rathmell was my favorite because since I remember he was riding a Montesa with the Nava helmet so I remember Malcolm was my hero for many times since I start to race. 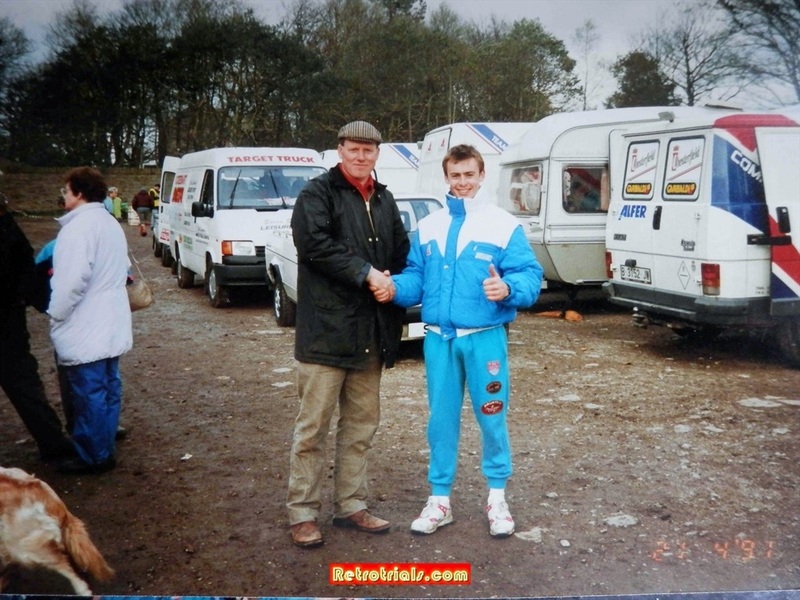 Here are a couple of nice pictures of Amos meeting his teenage idol Malcolm Rathmell at the Red Lion pub. 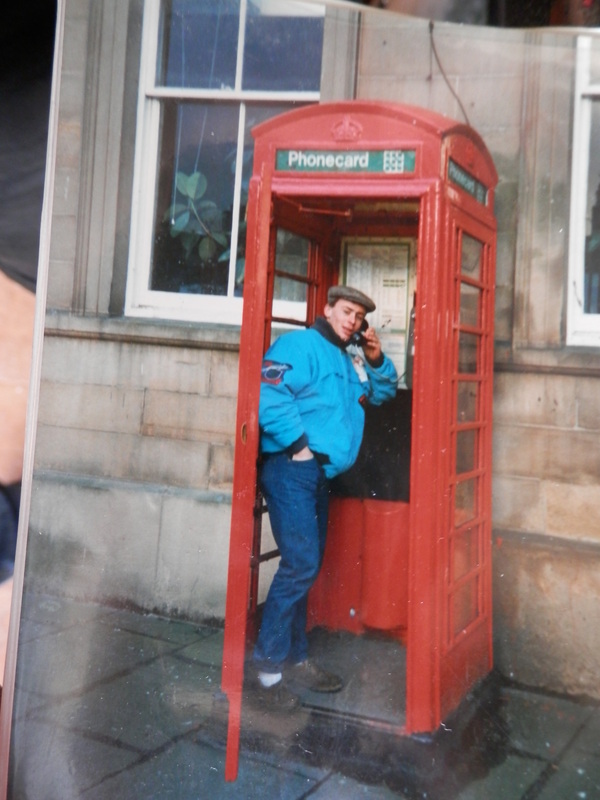 Amos and Andreu Codina at this time stayed with Malcolm and Rhoda and the Grassington hotel , which they ran. What do you do when you come to the UK ? When I was 15 or something like that then I start to look at Jordi Tarres then Iike Diego Bosis and he was the best. His riding style everything, you know, I like him a lot. For years I like Jordi. I work with Jordi. 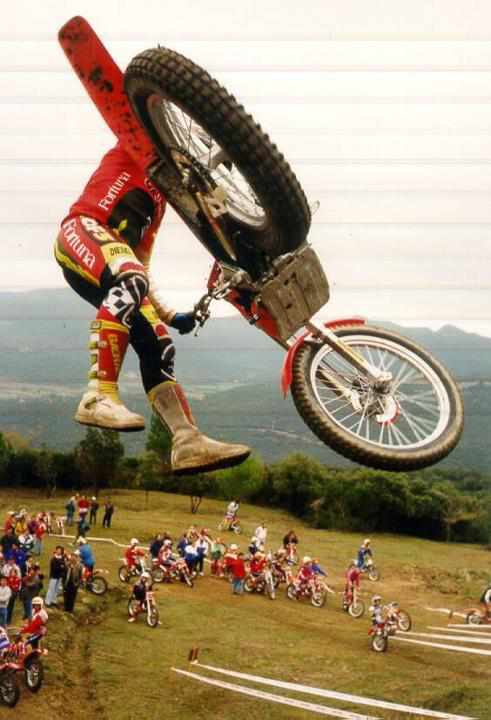 I was in the same team on the same bike, but Diego Bosis was very very spectacular and very impressive riding. At 16, I then move to Barcelona. My first World Round was in 86. I make 2 rounds. One was in Spain, which was in Peromoyer , in between Lieda and Andorra and the 2nd one was in Italy. So I made these 2 races and I make all of the Spanish Championships and I live here and only spend a few days in Barcelona, but then in 87 I made half of the World Championship. In these days the calendar was like ok, one race in Spain and then France, then Belgium, then England, then one in Italy then Czech Republic and then Poland and Germany. It was like you go for one month. You together in the van with Andreu Codina, with Gallach, Gabino Renales. So from March to June I miss all the school when I was 17. 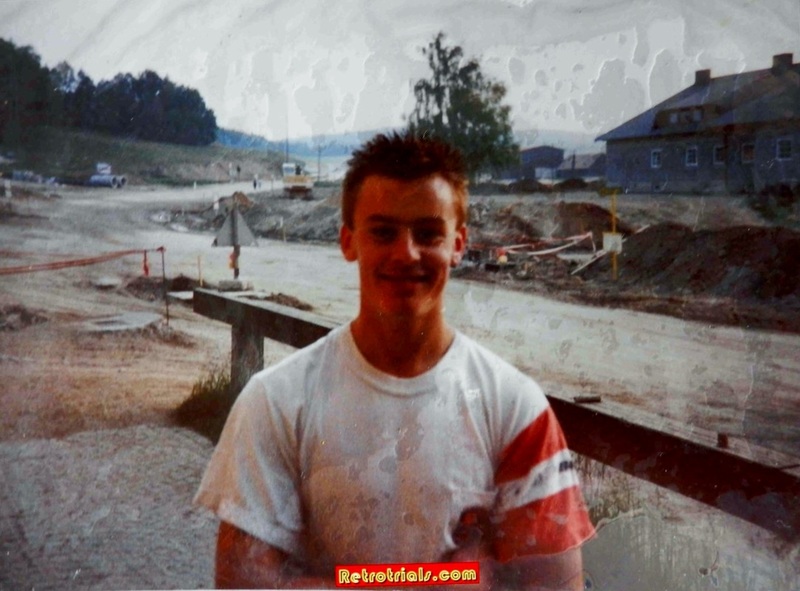 Then when I was 18 I made all of the Spanish Championship, all of the World Championship and many indoor. I was at school but all of the races and practices were in Barcelona and the World Round, so I have to move and I go for these 4 races. In June when I have all of the exams I was at the races. This was not easy for my parents I know but they have talk a lot with the people from the Federation and people from Antonio Trueba. Trueba say Amos is doing very good, he can be good doing this job, during this year..
Was it difficult for your parents to accept? Yes, but Is 16 not 14 or 12. At 16 many people start to work. I was not perfect in the school. I think I pass the exams but my mother was a teacher. She was a teacher for the young kids. I had good fun at school but I don’t remember it was a long time ago. I remember it was funny, funny. I just play around. If I have an exam in 10 days I wait till the last day in the afternoon to decide that many be now I am going to read the book and then I say on the way to the school tomorrow morning I check the book. So it was like it has no sense and I no read the book ha ha, but still I was not a bad student. Who noticed you when you were riding the moto and picked you out? 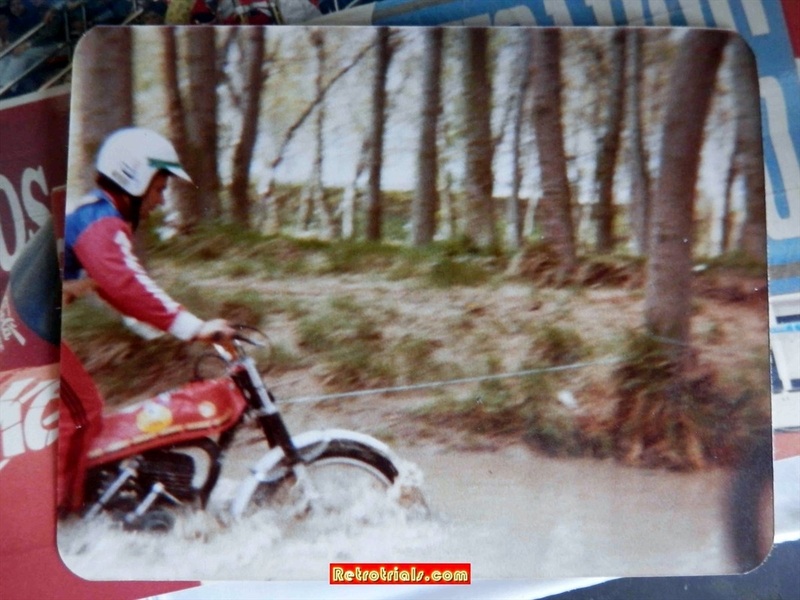 I start to make the trial with my father and his friend in all of this area and there was not a top rider, so I was doing things that nobody was make in those days and this was something strange about, the riding style. So the first time we moved to Spanish Championship in 85, the Junior Class with Oscar Giro and many riders from Barcelona I get with my Cota 242 painted red with the beta stickers, then Trueba stickers, because we buy handlebars and many parts from him. I won the trial but I went out because I was one minutes late so that makes first time out and hey this is very good result. I beat all the people from Barcelona who had been riding for a while. 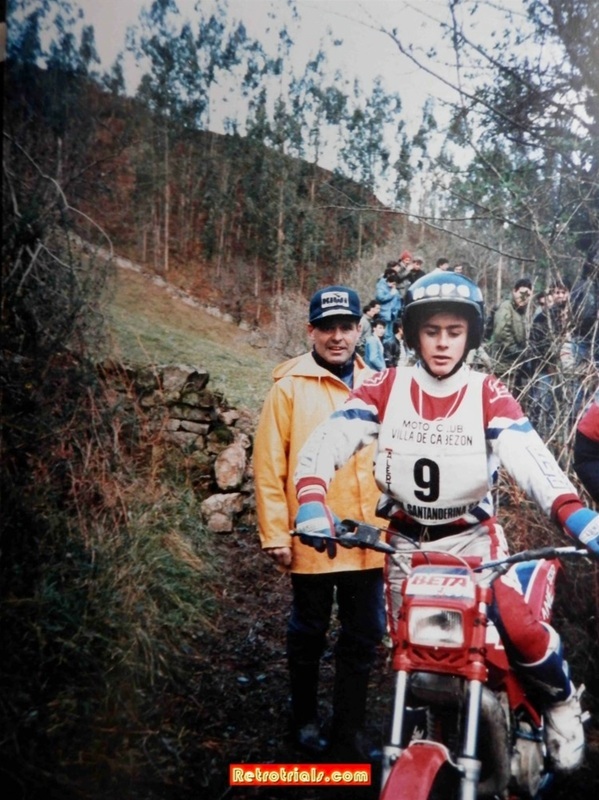 This was my first trial, in the Spanish Championship. I won at this time when I was 15 and I was 2nd in the Championship. From this moment we thought “hey, we going to take this a bit more serious “. Then Trueba give us a Beta, let us have it, no need to pay for the bike and start to make very good results at the Junior Class in the Spanish Championship different places. Did you have to be 16 to ride the Championship? Not in those days, not in those days. I ride a 250cc bike in those days everything was cc. I stopped the Trial cin at 13, 1983. In 83 when I finished with the bicycle I went with my father to test from here to this mountain with his friends and we are going to make a few sections here. When do you remember your first competition as being? I think with 8 years, but I am not sure. After you had left school, had you ever had a normal job like the rest of us? Have you ever ridden Enduro or motocross? Just for fun, Motocross, when I start at 7 years old I start with both, trial and motocross and prefer motocross much more but my parents stop me because in those days they start to bring special bikes for kids from Italy and many places and there were some fights in between the parents. There are two categories. I used to ride with the Cota 25 with several modifications. A different exhaust, but then they start to bring in much more powerful bikes and my parents stop me and tell me to just make the trial and bicycle but I like the motocross a lot, I still do. It’s too dangerous. When was your first World Round? My first World Round was in 86. In 86 I make Spain and Italy, I finished 41 and 43, something like that but I think there were about 100 entries. How did you get the initial introduction with Trueba? I think he know my father, because he had travelled to Barcelona for the 3 days and many places he was a trial enthusiast and I think he talked with Trueba and start to buy handle bars and special parts for the Montesa and from that point Trueba start to look after me and before you buy the handlebars, now give you the handlebars and I give you a few tyres, I give you the mudguards and ok I give you this bike for this year and for the season after the season you given the bike back to me and I give you a new bike. It was in 86 that I get the first bike from Trueba.